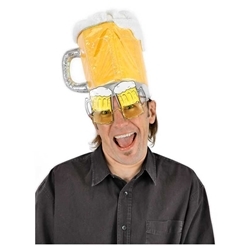 Beer Mug Hat adult includes hat with fabric lining, secret pocket with fortune and velcro size adjuster. Beer Mug Hat Adult fits 57-61 cm heads (23.5 inches). Item comes in iridescent fabric.